The Winco PLD-8R One-Piece Red Salad Bar Ladle 3/4 oz., 8-1/2" Long has an angled design for easy pouring and a 3/4 oz. bowl, perfect for drizzling dressings, toppings and other condiments onto food. 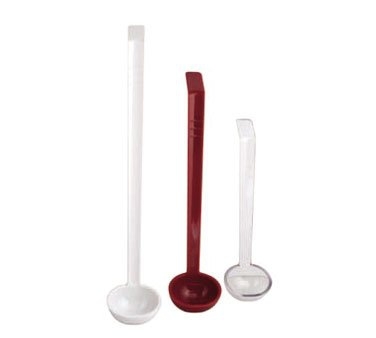 Constructed of sturdy polycarbonate with an easy to clean one-piece design, this red ladle will be a popular serving utensil in your food establishment. Winco LDI-12 One-Piece Stainless Steel Ladle, 12 oz. Winco LDI-4 One-Piece Stainless Steel Ladle, 4 oz. Winco PSSB-10K Black Salad / Buffet Spoon, 3/4 oz. Winco PSSB-10R Red Salad / Buffet Spoon, 3/4 oz. Winco PUT-9K Polycarbonate Utility Tong, Black 9"